In North America, September was the snowiest on record dating to the late 1960s. And in Siberia, the snow is going gangbusters so far this October. Some scientists suggest all of this snow so early in the year may be a harbinger of a rough winter for the U.S. and Europe. Snow fell early in North America, including in places that rarely see it in September. The article goes on with a snow anomaly map and more. While the link between North America snow cover early in the fall and conditions in the forthcoming winter may be considered speculative, studies have documented a more solid connection between October Siberian snow cover and the coming cold season. The studies show that when Siberian snow cover extent is prosperous and increases rapidly in October, it provides a strong signal that a weather pattern known as the Arctic Oscillation (AO) will tend towards its negative phase during the winter months (December through March). This entry was posted in AGW and Weather News Events and tagged cold, News, Snow, weather. Bookmark the permalink. Yes, Jason, Mother Nature does not follow climate models nor the trail of government grant funds as closely as well-funded consensus climatologists. It will probably go back to the low levels of 2011 and 2012 again. This could be the main reason of the cooling of the N. Pacific, even the typical ring-shaped cold pattern seems to have started to form again. /2/ The AMO is also giving signs of imminent change into negative mode, but usually the reliable experts, like J. Bastardi and other knowledgeable folks, tend to put the flip some 2-3 years in the future, but if for any reason the flip actually started now, we could be witnessing the beginning of the process. 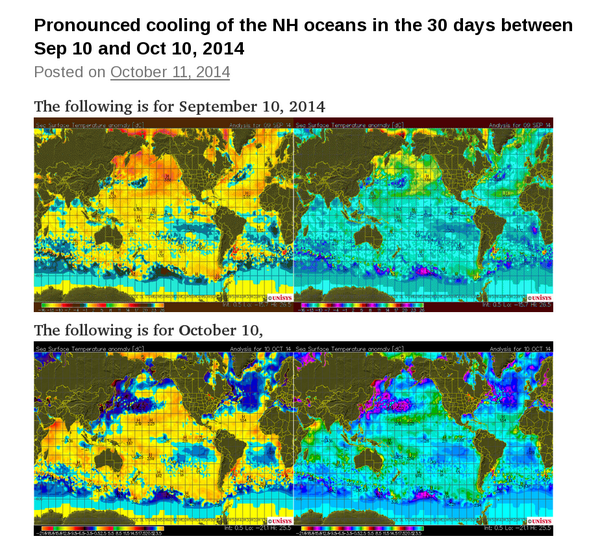 Note how the N. Atlantic seems to have even colder anomalies than the Pacific. and due to its extended period of continued eruption (more than 1 month now) it could become a VEI-5 eruption in the next few weeks (or days), then it’s reasonable to ask to what extent this continuous, relatively strong, eruption could already be affecting the NH climate. The argument *against* this hypothesis would be that the eruption has been relatively “calm”, corresponding to low energy of the ejected gases and ash in the atmosphere. In this case, the large amount of SO2 would not affect the climate considerably *because* it would not reach the stratosphere in large amounts. I don’t know how much of this “counter argument” is correct or not. I’ve cut my wood for this year, and there’s more in the back if I need it. Atlanta has seen a mild summer this year, mostly due to a lot of cloud coverage and rain, so I am preparing for ice storms and wind damage (much like last year). Now would be a good time to puchase a new generator before prices go up. Usually, when North America is in the icebox, Siberia is relatively “balmy” (not tropical, but warmer than usual). That both are experiencing higher than normal snows is what I have feared for this year. It may just be a blip, but I think we are in for a repeat of last year. Is it a trend? Only a dozen more years like it will tell. But it is a slam against alarmists. I remembered that another possible cause of accelerated cooling of the NH (the warming ended in 2007) could be the beginning of another Bond cycle, i. e., a large, long period and powerful cycle that would be adding to the more usual suspects of climate oscillation, like PDO, AMO, volcanic activity, ENSO, etc. I tend to believe that these long period oscillations have strong signatures– indicating that they’re happening almost independently of “anything else”– because they have deeper, more powerful causes, as opposed to local (short period) ones. The natural suspect of the “cause” of phenomena like the Bond cycles, goes to deep ocean waters and their immense Thermodynamic reservoir of cold temperatures, which could be surfacing now due to some oscillation characteristic of the entire thermal equilibrium of Earth’s climate as a whole. climate change that I have been putting forward for some time. fed down to the lower stratosphere within the polar vortices. solar energy that gets into the oceans to drive the climate system. persistent on the time scale of Maunder Minimum to current Warm Period. Great Lakes surface temps are down, so at least that would indicate a reduction in lake effect snow. Snow (well 20 cms.) on the Blue Mountains just inland from Sydney. Torrential rain in Sydney (170 mm. in a few hours, airport flooded etc.). Record low temperatures overnight in parts of South Australia (or in some cases since 1909). Surely proof of Global Warming??? Snow early in Siberia? Is that a trigger for France or Germany to invade Russia? Great Bad Ideas of the past would indicate Yes. LOOK OUT RUSKIES here they come again! With regard to Bardabunga, since it’s not (so far) an explosive volcano, the SO² doesn’t reach high enough into the atmosphere to have the same effect as Eya or Katla…I’ve seen this somewhere (probably back in 2010 with Eya), but it would be nice if someone with more info could chime in. the wind patterns. There are 4 large cyclonic centers around the N. Pole on the warm / cold interface and a vortex in the center. Then there are a few smaller tighter vortexs (tropical storms) scattered over the ocean. IMHO what it is showing is that the heat is being sucked up from the ocean surface via circular winds, lofted high, cooled to space, then coming down as cold stratospheric air in the polar vortex. Something similar at the S. Pole, but only one big vortex and the hot air looks like it is more nearly rising up over the equatorial area (shifting height on the graphs lets you track the 3rd dimension in a rough kind of way). So without regard to what is “doing it”, the result looks like a swirling rotating cyclonic heat engine dumping heat to space at the poles via lifting are over water. IMHO, it’s the lack of UV lowering atmospheric height that’s letting the circular structures more effectively move mass and heat to where it can leave. Yes, I’ve saved about 3 dozen snaps of wind and relative humidity graphs from nullschool ;-) Just on another computer… so maybe I can move them over on a chip and get a posting put together from it… At any rate, for now, it’s dramatic. I wish I had a wood stove… All I’ve got is 80 F days and sun …. (Yeah, I’m glad to be in Florida ;-) OTOH, pretty much stuck with needing AC all the time. Glad to hear that California is finally getting some rain. Maybe it will put some of the fires out. So Australia still getting some snow too, eh. Hmmm….. IF the top of the caldera falls in, it will go ‘way explosive way fast’ as a few million tons of ice meet more millions of tons of molten rock. Last I heard, the top had drooped about 60 feet and was still dropping. Thanks for the link. Always nice to know your stuff is being confirmed, even if they don’t do you the courtesy of a h/t or citation. The Internet never forgets. I’d noticed that too. It looks global to me. Not just regional reshuffle, but a rapid cooling of the world, starting at the poles and moving toward the equator. N.H. shows up more, but that Antarctic ice extent is making a statement too…. And, remember, this is the TOP of this particular solar cycle. Hang on, boys and girls, it’s gonna be a bumpy ride into this Grand Solar Minimum. From time to time I’ve speculated on a new Bond Event Zero ™ – sidebar: I’ve noticed that the warmistas have now christened The Little Ice Age as Bond Event 0 on the Wiki pages. IMHO, it isn’t that, but the future will say. It’s not clear to me if we enter the real Bond Event Zero now, in this grand minimum, or in about 350 years at the bigger dip to come. BUT, as we’ve seen, there are 1/2 Bond Events and even 1/4 Bond Event cold times, so in any case we ought to be seeing a lot of snow and cold for the next 20 years. IMHO “happening now”, with a 20 year run to colder. A few years ago I read a little news story about how NASA had sent up a probe to locate the level of the ionosphere and found it was ~400 meters lower than expected. It said nothing about what might have caused that lowering. I thought it was related to the lower levels of EM emissions. I was thinking along the lines of more “M” than “E”, but UV is on the continuum, n’est pas? I did see recently that UV levels are significantly lower, even if TSI isn’t so much. How could lower UV levels cause the atmosphere to lower? Any comment on what the connection might be between lower UV levels, lower atmospheric levels, and greater amounts of volcanism? P.S. I’m glad you have a computer again! At the time I posted about the lower snow levels on the local mountains in winter in San Jose. Searching on Mt. Hamilton on this site ought to show the posting. Yes. Oh yes! I’d not realized how much I depended on a real keyboard and mouse. I tried to use the tablet, and it’s a nice portable output device. But it is just horrid as an input device. The gesture based mark / cut / paste is very error prone and things that take 10 seconds with a mouse are closer to a minute or two, or never quite right. The KB lets me do about 60+ WPM, while the tablet is maybe 25. The KB overruns the CPU at that speed (with an added KB… without that KB, it’s down at hunt and peck 1 letter per second max. That, and the free flow of ‘ideas to fingers’ comes to a halt. I’ve typed so long I don’t even think about it. Doing the touch screen and going turtle slow just kills it. At any rate, so far I’m happy with the ChromeBox as a dedicated posting / internet platform. It is not something I’d use for anything requiring privacy or where I wanted to do production analysis (i.e. compute engine), at least not until I get Linux on it; but it makes a dandy browser with some storage. @EMSmith: Finally a dedicated Internet IO device! The pen entry is great for anyone who can not type at all. Beyond that, not so useful. The built in camera is nice (pictures of whiteboards and drawings… or of clouds or…). So eventually I gave up, and realized after “saving my nickels for a while” that I’d not checked the tip jar lately (not having a decent computer to do it… egg meet chicken…) and realized there was enough for the ChromeBox. I’m hoping to do a sort of ‘unboxing and first use’ posting about it. Need a bit more “use” first though. Great browser… and since that’s all that’s needed for a blog, working great for that.